Once in a while the same question keeps poping up: how many items can be stored in a list? How many documents can be stored in a document library? Microsoft published an overview from a technical perspective, giving guidelines as well as showing the impact on performance when the number of sites or items increase. After I received some feedback on my post on filtering with NHibernate, I starting thinking on how to leverage the filter capabilities of NHibernate to create a system for creating localized applications. While the previous post already considered using filters for multi-language apps, there was some criticism. When I want to localize a pizza I had to create a new record in the database. One of the first drawbacks was the fact, that the ID of the pizza is not unique anymore, since each pizza exists for each language. Well, this is actually just a matter of “adjusting” the data model a little bit. You could just create some internal ID for each pizza as the primary key or you create a composite key based on the ID and the locale-code. A bigger problem is the fact, that you will have to duplicate all the data, which isn’t actually changing for each pizza, such as the price. Some explanation: a pizza has always a list of toppings. Pizzas as well as toppings have name, which should be localized. This name can exists in various languages for a pizza. The class LocalizableBase adds a list of strings, which contains all localized strings. This way we don’t have to store language invariant data redundant in the database. OK, since we have our revised model, the actual usage is straight-forward. At first we create some toppings. Each topping has an internal, language-invariant name. Using AddString (from LocalizeableBase) we can add strings for a certain language. The same applies for pizza. In order to get a pizza, we just create a simple query. As the above sample shows, we just have to define our filter once (!). In the actual query we don’t have to deal with the filtering anymore, this is all being handled by NHibernate. Finally I would like who this is all accomplished. At first we store all localizable strings in a separate table. This table contains strings for toppings as well as for pizzas. 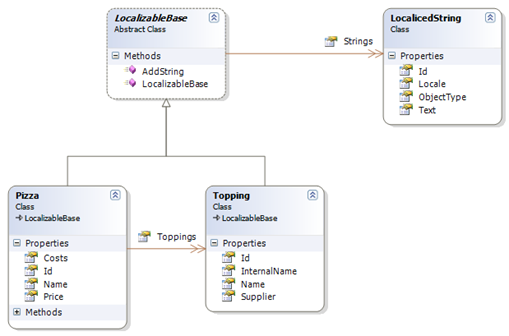 This table is being mapped to a class, which is used by LocalizableBase. The property ObjectType stores to which entity this string actually belongs to. The value for this property is being determined in the method AddString in LocalizableBase. This way the pizza entity doesn’t have to take care about setting the property to the correct value. Besides the object-type, we also store the id of the actual object. Since this id is not directly being used, we don’t need to map it to the database (at least not at this point; we’ll see that later). /// Initializes a new instance of the <see cref="LocalizableBase"/> class. OK, now we need the entities for pizza and topping as well. This is actually nothing earth-rocking. The property Name returns always the first localized string that was found for the entity. If no localized string could be found, we just return an empty string. /// gets or sets internal name of this topping - this is language invariant! The clue to this solution is again the usage of NHibernate filters, in order to get the strings for the desired language. For that purpose we filter for the desired locale. In this mapping we also find the ItemId property, which was kinda missing in the LocalizedStrings mapping. The ItemId refers to the Id of the item, to which this string actually belongs. In combination with the ObjectType this should be unique. Besides the filtering to a certain language, we also only want to get strings for the current ObjectType. This is done, by specifying a where-clause in the bag-definition. This way we only get strings for pizza. While this removes the actual need to deal with the ObjectType in the query, we have to specify it in the mapping – well nothing’s perfect. If you already have an application with a lot of existing queries, this might be a better approach. Windows Server 2008 R2 comes OOTB with an IFilter, which allow the indexing of TIFFs. During the indexing the IFilter performs an OCR to recognize the actual content of the TIFF for the index. This combined with a corresponding scanner introduces a small-sized DMS, where you can scan paper based documents to a document-library and let them being index and thus fully searchable by SharePoint.